In a iron disc there is a hole at the center. A brass rod of equal size is exactly fixed in the hole. To get the brass rod out of the hole, what shall we do with respect to temperature? To solve this problem we shall understand one simple concept. Coefficient of linear expansion is a measure of expansion of the material with respect to the rise of the temperature. It is also a measure of contraction of a material with respect to the decrease in temperature. 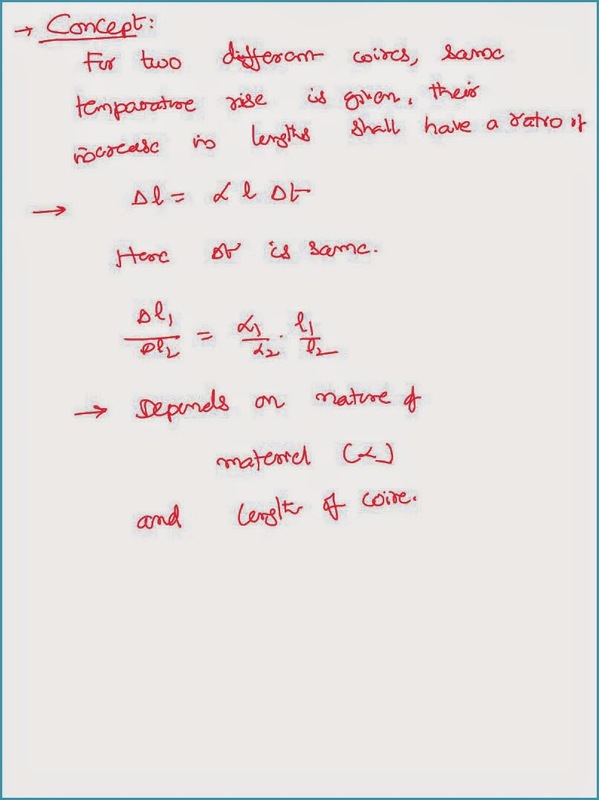 If a material is having a higher value of coefficient of linear expansion, with the increase of the temperature at expands more and with the decrease of the temperature it contracts more. We know that coefficient of linear expansion of brass is more than that of iron. Hence if you rise the temperature brass expands more and it becomes further very tight in the hole. If you decrease the temperature brass contracts more therefore it can be taken out from the hole quite easily. Two different materials are having different lengths at a certain temperature. What is the condition for the difference between the two material lengths always remains constant at all temperatures? If the difference between the two lengths has to remain constant, both of them shall increase their lengths by the same value with respect to the increase in the temperature. So we shall equate the increase in the lengths of both of them. Find the ratio of expansions in the two wires when same heat energy is supplied to both of them? When same temperature is given to both of them we can say that the increase in the length of the materials is directly proportional to its length, coefficient of linear expansion and the rise in the temperature. When the same heat energy is given to both of them they are not going to expand equally. The material with more specific heat will expand less and vice versa. 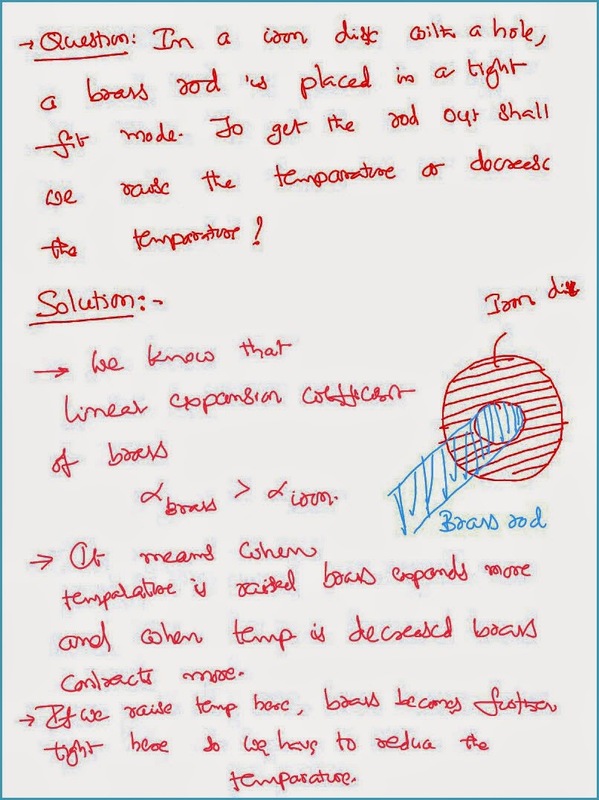 So we shall take the concept of specific heat into consideration while solving this problem. 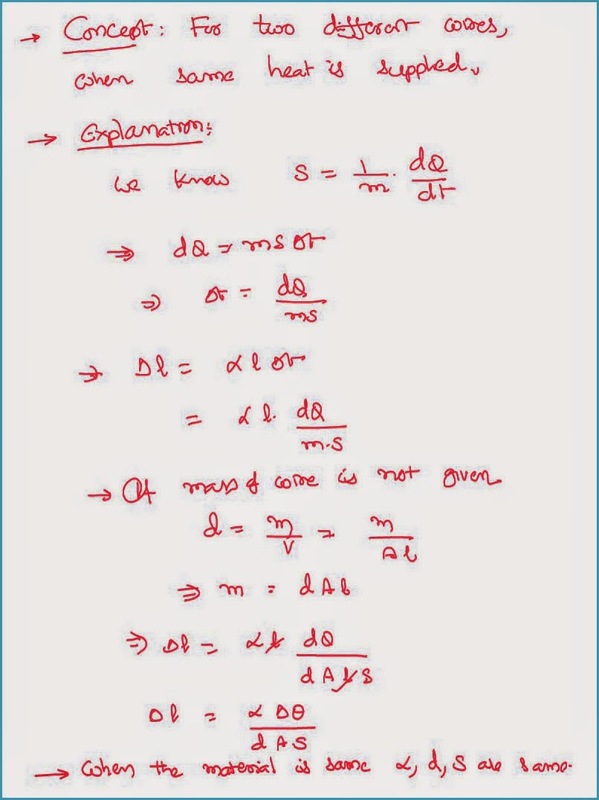 It can be proved that the increase in the length in this case is going to be independent of the length of the material but depends on the area of its cross-section.